Finalist for the 2018 International Association of Culinary Professionals (IACP) Cookbook Award for "Baking" category A collection of over 110 recipes for sweets, baked goods, and confections from superstar chef Yotam Ottolenghi, thoroughly tested and updated. A New York Times best seller NPR's Best Books of 2017 "With Jerusalem and all the books that followed, Yotam Ottolenghi changed everything about what we cook and crave. Now, with Sweet, he and Helen Goh shake up dessert. In signature style, the recipes are generous, warm, inviting, and copiously sparked with inspiration. Yes, bake those brownies with tahini and halva. Add star anise to blackberry cakes. Revel in the exciting new flavors Sweet brings us. It's what I'll be doing." "After winning us over with his savory offerings, Yotam Ottolenghi, with Helen Goh, comes to the sweet side with an international array of gorgeous cookies, cakes, candies, custards... I want to make everything in this luscious book!" "Yotam Ottolenghi's additions to classic recipes make so much sense, you'll wonder why you've never stirred tahini into brownies or orange flower water into amaretti--or why you've never even made your own amaretti! This is my kind of baking book; you'll want to make everything." --Elisabeth Prueitt, co-founder of Tartine Manufactory and author of Tartine All Day "Modern, creative, appealing, and, most importantly, fun--this is Ottolenghi at the top of his game." --Publishers Weekly, Starred Review "It's ridiculously beautiful just like all his books, and filled with delicious recipes, same." --Sam Sifton, New York Times "An Innovative Dessert Cookbook You Won't Want to Miss"
--WSJ. Magazine "In a world with so many unknowns, it's a relief to open a book like Sweet and know for certain that following these recipes, step by step, will yield a perfectly moist bundt cake, pillow-y pavlova, or crispy-crusted crostata. Like Ottolenghi's other titles, this is a keeper." --Eater "The recipes are accessible and charming, as you'd expect from the guy who's pretty much single-handedly responsible for the current renaissance of Middle Eastern cooking (with apologies to Claudia Roden)." --Los Angeles Times "Ottolenghi fans have been in a full-on frenzy since he started a New York Times column with all things dessert. Now, they get a whole book of sweet recipes featuring the chef's signatures, like heady saffron, orange and honey madeleines; stunning floral cakes; and tahini-halva brownies that will ruin all other chocolate desserts for you." --Tasting Table ..".filled with beautiful, inspired recipes, some satisfyingly challenging, others very easy to execute. If you love baking and want to spice up your game a little bit, this one is for you." 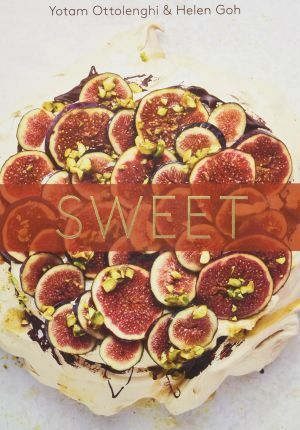 --BuzzFeed "As with Ottolenghi's previous titles, recipes are written in clear, direct language, flavor parings are bold and unexpected, and the results -- whether a tray of simple cookies or a towering torte -- are stunning." --Christine Muhlke, bon appétit ..".an eagerly anticipated, 368-page master class on how baking can offer both comfort and the thrill of discovery." --WSJ. Magazine "Whether you're a newb to the oven or hoping to perfect your baking skills, you'll want to grab chefs Yotam Ottolenghi and Helen Goh's SWEET cookbook. Chockfull of tips, tricks, and drool-worthy recipes, the dynamic duo will have anyone feeling like a pastry pro in a matter of minutes." --Chowhound "With their splendid good taste, strong sense of design and bright, culture-hopping palate, Ottolenghi and Goh have created a stunning book of sweets. Even for those who don't bake, it is weep worthy." --Atlanta Journal-Constitution "Ingenious flavor combinations elevate old favorites and new creations in this brilliant and beautiful book of desserts and sweets by two famed British chefs." --Nigel Slater "With his 2012 cookbook Jerusalem, London restaurateur Yotam Ottolenghi [has] created a sensation by sharing his unexpected and highly personal take on Mediterranean cooking." --Food & Wine "Jerusalem is the top-selling cookbook in the country, subverting the conventional wisdom that you need to have a TV show to have a bestselling cookbook. The book...has become something of a phenomenon." --Publisher's Weekly "Plenty...is among the most generous and luxurious nonmeat cookbooks ever produced, one that instantly reminds us that you don't need meat to produce over-the-top food." --Mark Bittman, New York Times "Yotam Ottolenghi's second cookbook has recipes for dishes largely absent from the American kitchen--a fact that almost never crosses your mind when you flip through it hungry. Everything sounds mouthwatering and looks-and is -doable." YOTAM OTTOLENGHI is the author of Plenty and Plenty More, co-author with Ramael Scully of NOPI, and co-author with Sami Tamimi of Ottolenghi and Jerusalem, which was awarded Cookbook of the Year by the International Association of Culinary Professionals, and Best International Cookbook by the James Beard Foundation. All five books were New York Times bestsellers. He lives in London, where he owns an eponymous group of restaurants and a high-end restaurant, Nopi. HELEN GOH is a pastry chef, longtime Ottolenghi collaborator, and the Ottolenghi product developer.